Auto service businesses, whether a dealer, franchise, or independent garage, appear to be doing a better job of serving their customers these days. The latest J.D. Power U.S. 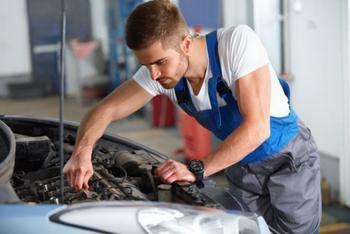 Customer Service Index (CSI) study shows "significant improvement" in the quality of automotive service. This includes things ranging from an oil change to a complete engine overhaul. J.D. Power measures service on a 1,000 point scale. In this year's survey, auto service businesses logged a score of 805, up from 779 the previous year. Customer service rose from 800 to 813. The study limited its scope to customers driving vehicle one to five years-old. "The quality of work—doing the job right the first time—can noticeably affect customer satisfaction and loyalty, but it shouldn't be viewed in a vacuum," said Chris Sutton, vice president, U.S. automotive retail practice at J.D. Power. "Proactive communication with the customer, especially while the car is being serviced, is one element that has a direct influence on loyalty." That may be an area where auto service businesses have increased their focus in recent years. Of those consumers in the survey, 55% said they will "definitely" return when their vehicle needs service. Customers who received text message updates and reminders from the business were significantly more loyal. Sutton said the research found that consumers of all ages prefer texts as a way of communication, yet only 3% said they get them on a regular basis. Sutton says auto service businesses that want to improve customer service and consumer loyalty should consider adopting text updates. In fact, the study suggests the adoption of technology by service providers may be the key to rising levels of customer satisfaction. It found the use of tablets by service advisors and online scheduling tend to boost customer satisfaction. The use of tablets rose from 17% in 2015 to 24% last year. One area where dealers fall short is servicing the increasingly sophisticated infotainment systems. Only 80% of consumers in the study said a dealer was able to repair problems with vehicle radios the first time.